New England, there’s probably a hidden treasure nearby. 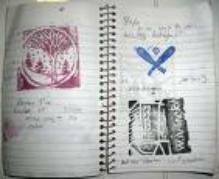 incorporates puzzle solving, orienteering, and stamping artistry. Tor, a craggy hilltop much like New England’s rugged granite summits. Internet, and Letterboxing North America (LbNA) was formed. mountains, some are secreted away in public buildings. or purchased), pen, and journal. hikers. When you “stamp-in” you’re essentially signing the letterbox’s register. good quality paper, such as a sketchbook, for the best stamping results. might change, for example, leaning dead trees. and in its proper location. LbNA’s website for a hidden treasure near you! finding. They have no clues, only a stamp and logbook. travel from one box to another and are unpublished.